Valley Venture Forum provides advice, opportunities for local entrepreneurs | CVF Capital Partners, Inc.
You can’t run a business without money, but finding that money can become a formidable obstacle to budding entrepreneurs and their start-up companies. 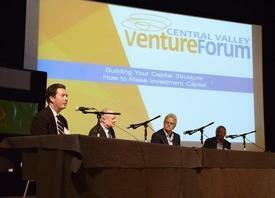 At Thursday’s ninth annual Central Valley Venture Forum in Clovis, a panel of investment experts offered their advice for how small businesses can maximize their opportunities to raise the capital they need to get their product off the ground or grow their companies. One, however, might not have that problem for much longer. Intuitive Motion Inc., which manufactures its innovative ZBoard electric skateboard in Modesto, won the Best of Show award from a slate of investment bankers and venture capitalists in the Valley Entrepreneur Showcase, the climax of the daylong business forum. Historically, the winner of the Best of Show trophy has received investment offers from prospective backers, said Tim Stearns, director of Fresno State’s Lyles Center for Innovation and Entrepreneurship and one of the organizers of the Venture Forum. Ben Forman co-developed the ZBoard — imagine Marty McFly’s hoverboard from the “Back to the Future” movies, only without the hover — with a classmate for a senior-year engineering project at the University of Southern California. Forman said the company was looking for a $600,000 investment for a 20% stake in the company, which began selling the motorized boards in 2012 and expects to rack up $2.5 million in sales this year. Each skateboard sells for between $650 and $1,200, depending on the speed and range — the top-of-the-line model can run at 17 mph with a range of about 18 miles on a full battery charge. The ZBoard differs from other entries in the powered-skateboard market, Forman said, because the rider shifts his or her weight forward or backward on weight sensors that control the direction of travel. Other electric skateboards use hand-held controls with push buttons to determine forward-backward motion. “We like to say it took three months to make it go and three years to make it stop,” Forman said of the product’s genesis and the engineering effort it took to develop a reliable regenerative-breaking system. If his company succeeds in finding investment backing, Forman said about half of the money would go into expanding production capacity in Modesto to keep up with demand. All of ZBoard’s sales are online; Intuitive Motion doesn’t have the ability to make more boards now for the retail market despite interest from skateboard stores. Forman’s company was among five hopefuls making pitches to the showcase competition judges with an eye toward prospective investments. For businesses on the hunt for capital, the expert panel said entrepreneurs need to be realistic with their expectations and have a solid plan to justify what they’re looking for from would-be investors. Institutional investors, the panelists said, not only examine a start-up’s revenue and expenses, but also look for a solid business plans, a strong management team and potential for growth. “We look at how it will get done as well as who is going to get it done,” said Ed McNulty of the Central Valley Fund, an investment group with a focus on mid-sized enterprises in the San Joaquin Valley. Brian Kerester of Wood Warren, an Emeryville-based investment banking firm, added that “a great product does not make a great company.” He said businesses needs to have “a good plan and a good team in place” to develop more than one product on which success depends and to build a company for the long haul. Stearns said additional resources are available to start-ups through the Fresno State center, including a new partnership with Silicon Valley powerhouse Cisco Systems Inc. for tech-oriented small businesses in the San Joaquin Valley. Cisco is establishing an Entrepreneur in Residence program through Fresno State in which it will provide expertise and mentorship — and, Stearns said, the potential for a financial investment from Cisco — to a half-dozen selected businesses. Fresno State and Bitwise Industries, a downtown Fresno hub for budding tech companies, are working to recruit the first crop of participating businesses now for a six-month program that will begin in January.